In the essay “Trouble-Makers or Truth-Sayers,” Martin Fackler recounts his time in China as a foreign journalist. While reporting on a nightclub fire in China, Fackler reveals the antagonistic relationship between the foreign press and the Chinese government as well as the characteristics of a state that is still struggling to adjust to a rising economy. Ordinary Chinese citizens are characterized as being frustrated at a government that appears to be either corrupt or indifferent toward their concerns. A heavily censored state-run media has also lead to many of these citizens to distrust the government further, often supporting or seeking out foreign journalists as “agents of truth” (34). China pushes the status of foreign journalists to the extreme in that they are often under strict surveillance, harassed, and coerced with “blatant attempts at intimidation” at times. Officially, foreign journalists are permitted to work without intrusion unless they violate government regulation that prohibits foreign journals from covering topics that endanger the national interest. In practice however, any reporter working on a politically sensitive topic is likely to be kept close under watch (33-39). This antagonism also becomes apparent between the government and the Chinese people. Fackler notes that there is a polarity of ordinary Chinese people when interviewed by foreign journalists, condemning them for slander as well as embracing them as “agents of truth” (34). While contacting people for information in China has gotten easier, officials and citizens alike are still reluctant to cooperate and provide the simplest facts. In part, the difficulty in cooperation is because China has had a history of a unilateral party system in which bureaucrats have ruled with an iron-fist. Disseminating any information that can be deemed slanderous has the potential of jail time or political suicide (37). Another factor that contributes to this resistance is that people still remember the turmoil of the Cultural Revolution. Mao forced political dissidents or enemies to “confess” crimes of being an anti-revolutionary and were often beaten and humiliated, which has been termed “struggle sessions” (37). Since 1979, officials have become progressively more selective in who they choose to put under surveillance, generally paying attention to those who are covering sensitive political topics. It is not uncommon to have cops in ordinary clothes shadow a correspondent or their contacts (34-35). In casting a hardline tone towards both its citizens and foreign reporters, the government has experienced backlash in the form of a critical foreign press and a resentful population. This is in conjunction with inefficient services, and a general lack of safety (45-46). Fackler argues that in order for this cycle to end, the Chinese government must move away from its repressive policies to a more technocratic rule. There are two Chinas. One is the modernized, urban version that the world has come to expect. The other is characterized by severe inefficiency through bureaucracy that lacks freedom of the press. In this way, Fackler hopes that China’s economic success will not be tarnished by the lack of political freedoms (48). Seen as both an entertainment and an informative piece, Fackler’s article blurs the line between journalism and fiction. As an entertainment piece, his account of trying to evade the Chinese government all in the name of truth paints an almost Orwellian story for the reader. In this world, an inept yet intrusive government constantly monitors the privacy and information of the public. While escaping the city late at night and submitting himself to the possibility of roadside bandits that inhabit China’s highways, Fackler is contacted by a random stranger from Israel who believes they are related. The absurdity of the situation of being attacked by bandits, chased by government officials, and talking to someone from Israel about family relations makes for an entertaining read. The reader gains a new perspective of China from the eyes of a foreign correspondent, a view that is not usually realized by mainstream media. Entertaining and clever in how he weaves this information into the story, overall Fackler does a good job in explaining the distrust that continues on between the government, its people, and the foreign correspondents that report on these issues. This does tend to blur the line of what is reality and what is fiction. Do Fackler’s attempts to entertain the audience for a good read get in the way of reality? China is notorious for keeping the flow of information tight and to Fackler’s credit, he does point out that things are slowly being liberalized in terms of information. My main issue however is that his writing style makes it difficult to determine where reality ends and story begins. A major issue with the article involved Fackler’s main plot point. Throughout the article he recounts his experience of reporting on a recent nightclub fire. State-owned newspapers claimed the death toll was roughly 300 but later Fackler finds the number to actually be less than 100. Fackler never properly explains why the number is grossly exaggerated. The story as a whole exemplifies the distrust and anger Chinese citizens are feeling towards the government. But why the state would exaggerate the number so greatly is never explicitly explained and contradicts the country’s need to maintain the image of a maturing, growing economy. 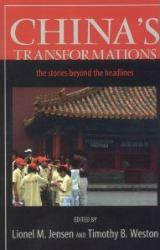 If you’d like an excellent primer on the social conditions in China, we highly recommend buying China’s Transformations: The Story Behind the Headlines on Amazon.